When was the last time you got excited to open a plain old envelope? Unless you know there’s money inside, plain envelopes are easy to ignore. Get people excited to see what’s inside by adding full color images and unique messages for each recipient to your envelopes! Don’t let all of the work you did on what’s inside go to waste in a plain-looking envelope – bring the inside out and tie your message together! 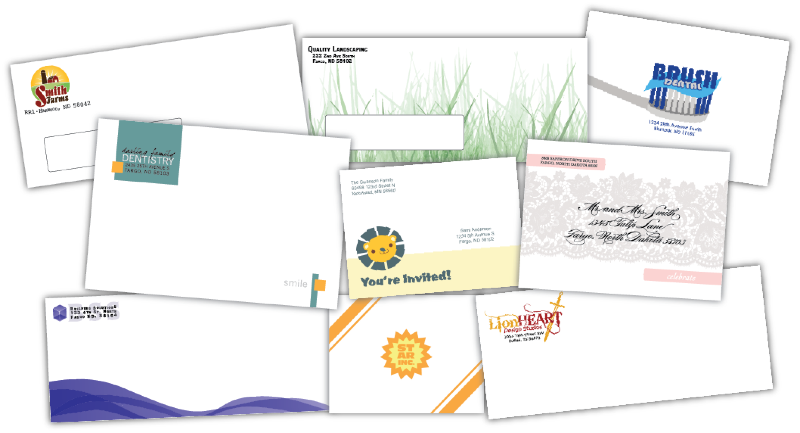 We’re using the latest technology to bring you full color and variable data envelopes at any quantity! Full bleeds? Color critical? No problem! Now you can get envelopes with the same service, dependability and next-day turnaround you’ve come to expect from Shortprinter.com! You can get great-looking envelopes for your business, personal correspondence or event invitations customized for each person! We stock all the popular envelope sizes and styles, and if we don’t have what you need we’ll get it for you. ← Magnets, Envelopes, Notepads, and More . . .